One day, Honey Kisaragi's a trendy, class-cutting Catholic schoolgirl. The next, her father's been murdered by demonic divas from a dastardly organization called Panther Claw. When his dying message reveals that she's an android, Honey uses the transformative power of the Atmospheric Element Solidifier - the very thing Panther Claw wanted to steal - to seek revenge against the shadowy clan. Can Honey fight her way up Panther Claw's ranks to defeat its leader, the sinister Sister Jill while managing to escape the watchful eyes of Miss Histler, her school's headmistress? Aided by journalist Hayami Seiji, his ninja father, and his lady-loving grade school brother, Honey sometimes appears as a racecar driver, sometimes as a glamorous model, and sometimes as a beggar, but her true identity is none other than the warrior of love, Cutie Honey! This anime deserves a review. I am a fan of seeking out older anime and watching it. This anime, as far as I am aware, is one of the original Magical Girl series. Where a girl transforms into different clothes/armor/etc to defeat her enemies. It's a simple concept and this is a simple show. It's your basic Monster of the Week fair. Ultimately leading to Cutey Honey taking on the ring leader at the end. Each enemy Cutey faces is interesting, but most don't have too much development. The death scenes can be quite brutal with a fair amount of blood. The problem with the show is it isn't finished. I'm sure the manga finished it, but not here. Cutey defeats a main enemy, but not the main ring leader. By the time the show reboots with Shin Cutey Honey you just have to assume that somewhere along the way the main ring leader was taken out. It puts a damper on an otherwise fairly entertaining show. Watch 2 or 3 episodes at your leisure and enjoy the funky beats. Just don't watch too much or you'll get burnt out due to the repetitive nature. I found the show entertaining. I think you'll feel the same way. In the time before time, there was an anime called cutie honey... I'm kidding. This is probably the oldest anime I ever saw. It aired in 1973 (nineteen seventy three). As a result it is pretty much unlike anything I've ever seen, and the closest thing to it, at least visually, is the first season of Sailor Moon. The anime is also based on works on Go Nagai, who is responsible for Devilman, Devilman Lady, Getter Robo, Mazinger, and many other things. The age of the anime is noticeable in every its aspect - story, characters, visuals, art style and music. It aired before anime became very popular and well kknown, and as a result it looks much simpler and much more naive than ANY modern title. The art style is quite different as well, with drawings being flat, and backgrounds being extremely abstract and colored in manner resembling old cartoons like Woody Woodpecker or Pink Panther. It is still a very nice anime, in the end, despite silliness, strange (by modern standards) style, simplistic story. The music is nice as well. The story is very simple and strictly follows "monster of the week" pattern. It also holds world's record at fastest character introduction - it managed to cover honey's backstory in 5 minutes or even less. Haven't seen anything like it. The story revolves around honey fighting a criminal organization, which wants a certain item Cutie Honey has, and every week sends another female monster after it. The monster always is some sort of hybrid creature, always female, always called "something - CLAW". The structure of every episode is the same every time as well - introduction of the monster, fight, followed by iconic transformation sequence, and brief wrap up. Overall the whole thing almost looks like a kid's movie (with a script written by another kid as well), that is until heads start flying. In the same naive fashion anime displays its characters, it easily introduces dismemberment and occasional death. Some deaths are quite gruesome, and after happily jumping around in another costume, cutie honey may lop off someone's head or limb with her sword. This doesn't happen often, mind you, but happens. Which reminds the viewer, that, in the end, it is an anime, and not a western cartoon. The story does not really have an overarching plot, and largest portion of it could be thought as more or less independent episodes, if next monster weren't introduced at the end of episode, although things change a bit at the end of the series. Locations, circumstances, people, interactions are simplistic, and remind of a kid's movie, and as a result are not very "believable", but still fun to watch. In the end the story is mostly about Cutie Honey prancing around switching costumes and killing bad guys. Art is unusual by modern standard. Characters are very "flat", meaning their visuals look like something half way between modern anime and, say, old cartoon like Woody Woodpecker. They don't really move about well, deform during movement, and anime does not really portray "depth" anywhere. The backgrounds in scenes resemble abstract painting, or old backdrops occasionally used in western cartoons. Pink Panther or old Cartoon movies. Basically, it is collection of shapes, usually drawn using flat color. Basically, coloring of backdrops is not dissimilar to, say, south park, although, lines in backgrounds are fluid. Hopefully it makes sesne. Most of the mechanical objects are not very well drawn, and barely have any detail on them. Main character - Cutie Honey - is amazingly cute, but some of the other characters are not. One of the side characters have a face that looks like a.. an undead peanut. Can't describe it in any other way. "Bad guys" always have evil face, fangs, "evil grin" and slanted eyes. Very different from modern anime. I would say that overall drawing style shares some similarities with very old titles - for example, it may slightly resemble the very first episode of Urusei Yatsura, and the very first episode of Sailor Moon... I'd say more similar to Sailor Moon, which had "swirly glasses" character. Music is amazing and catchy. Original intro is something you'd want to sing along to ("Kono goro hayari na onn-nano-ko...") and will get stuck in your head. There's also a constant "whispering" theme that usualy plays when an episode displays this week's villain. (you'll recognize it when you hear "Shi.. shi, shi, shi- shi... SHAAAA!" in background). The anime doesn't have too many soundtracks, however, and seem to be reusing about 5 tunes total. Characters are pretty much symbols. They have specific role or function and are completely defined by it. Cutie honey's role is to kill bad guys and look cute while wearing outfits, for example. They don't really develop anywhere, and don't have much of personality to display, they pretty much only do one thing they were designed to do. Honey occasionally tries to act seriously, but it always comes off as awkward and strange.... then again it is sorta in line with "naive old anime" feeling about it. It was an interesting and a very refreshing experience. The anime is unlike pretty much anything that is released nowadays, and it was nice to see something from time when plots were simpler, grass was greener, etc. I recommend to check it out, if you have opportunity. For historical opportunity, or to see what anime used to be in 1973. However, if you're looking for anything serious, the anime might not be the right choice, becasue despite its occasional attempts to have serious or dramatic moment, it may look silly... but then again, it is Nagai GO material, and some of his older works may come off as a bit direct/naive by modern standards. So, for something more serious, a good candidate would be original Sailor Moon, which starts off with similar formula and somewhat similar old art style, but then becomes much more dramatic. This year marks the 50th anniversary of Cutie Honey creator Go Nagai’s career, which is why I will be reviewing this lovable, corny classic. Cutie Honey is a particularly important series to the magical girl genre (and anime/manga as a whole) for being the first magical girl series created for a young male audience, which was unheard of at the time. As such, campy action and the addition of fanservice were integral to making Cutie Honey the iconic and influential series it’s known to be today. Cutie Honey’s story isn’t overly complicated. An android schoolgirl seeks revenge after the murder of her father by the wicked Panther Claw organization, who are after the Atmospheric Element Solidifier (how it was translated in the Discotek DVD release, but some translations of the device’s name may vary), which is stored inside of Honey’s body (though the villains don’t find out about this until later). In the first episode, she meets a news reporter named Seiji, who doesn’t formally meet Honey until he wanders into her place of residence not long after the murder of her father (they briefly met before that when Honey nearly crashed into him while biking her way home). He has a thing for Honey, and she eventually begins to live with him and his family, which consists of Seiji’s father and younger brother. Each episode has a monster of the week formula, with Panther Claw’s method of crime varying per episode. In Some episodes, Panther Claw will go after a specific luxury item, usually something like jewelry or a high end art piece, as Panther Claw specifically specializes in stealing “beautiful things” (as they say it themselves). Honey and the gang are often quick to catch onto Panther Claw’s antics and save the day. When Honey shows up to fight the bad guys in these episodes, they tend to take honey’s arrival as an opportune time to try and steal the Atmospheric Element Solidifier, as she is their primary target, even if they also have an interest in the luxury item. In other episodes, the bad guys are only interested in Honey and the Atmospheric Element Solidifier, and not a specific luxury item. In every episode, like in any show containing a monster of the week formula, there is a specific monster assigned to the task of carrying out the evil higher-ups’ plans, which Honey will kill each and every time. Panther Claw also has Masked Lackeys with guns who disappear and make a laser-like sound as they die. Not only that, but these masked lackeys appear ridiculously easy to kill. I recall a few times where they were basically just kicked to the ground, and they still died and vanished. That might sound like a negative thing, but I think the unintentional hilarity genuinely adds to Cutie Honey’s campy charm. On the topic of campy moments, another member mentions that the characters are off model a lot of the time, which is true, but I think that’s just awesome. There was a scene where Honey and Seiji were in a helicopter, and Seiji was operating it. In that scene, there was a particularly long frame where Seiji’s hands were very noticeably disproportionately large in comparison to the rest of his body, and I just thought that was the greatest thing ever! Seriously, what is not to love? It is so cheesy! None of the characters in this show are overly deep, but they don’t have to be. Cutie Honey is fairly simple anime that does just fine with a very simple cast of characters, and Honey is very lovable in her own right. She’s brave, badass, mischievous, and I just adore her! The art and animation, on the other hand, is very cheap and stiff, but it is a 70’s anime, so it’s forgivable, and can be very charming to the right person. If you have a strong appreciation for retro anime, then you’ll love and have little problem with Cutie Honey’s art. However, to fans who watch primarily newer anime and little else, it might be a struggle to get through this show, as it’ll take some time to get accustomed to if you’re not used to older titles. The theme song is iconic, and there’s a reason it’s been used as the opening theme for almost every anime adaptation of Cutie Honey (I read that Cutie Honey Universe broke this trend, but correct me if I’m wrong). It will be stuck in your head for days on end , and it’s so good that you probably won’t even mind! The ending theme is a slow, beautifully sang tune that will probably stick with you as well. It’s not nearly as catchy as the opening theme, but I still find myself listening to it from time to time. It seems that many other reviewers have mentioned the psychedelic BGM, which is very memorable. Oftentimes, I struggle to remember BGM tracks for anime, but I always try to mention them in my reviews. I often comment on whether or not they were memorable enough, in order to see if they make a positive addition to the overall soundtrack. Cutie Honey delivers with its very 70’s psychedelic BGM, as there are quite a few tracks that I’m still able to remember. The BGM is perfect for this show and does a pretty great job of immersing you into the setting. Overall, the soundtrack to Cutie Honey is fantastic. In conclusion, Cutie Honey 1973 is a classic that has the right appeal to a certain audience. I can’t really say that it’s aged all that well, despite my nonstop praises in this review, but I think that if you are a retro anime fan, or just have an appreciation for the history of anime, you should give the original Cutie Honey a shot. Cutey Honey is a show produced by Toei Animation and is directed by Tomoharu Katsumata (Devilman). 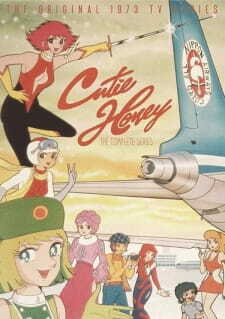 Cutey Honey is based on the manga of the same name by Go Nagai. It is regarded as one of the very first magical girls. The story in Cutey Honey is quite simple. Kisaragi Honey is just your average catholic schoolgirl (not). One day she returns home to find that her father has been killed. An evil organisation called Panther Claw is responsible for his death. His dying message reveals that Honey is actually an Android that can use transformative powers thanks to the Atmospheric Element Solidifier that is located inside her body. The Atmospheric Element Solidifier is also the very thing that Panther Claw killed Honey's father to get a hold of. Now Honey has sworn to become the warrior of love Cutey Honey, and to get revenge on her fathers killers. Cue monster of the week. This show is little more than a monster of the week show, with the added benefit of fanservice. Cutey Honey is silly and over the top. Seing Honey not just defeat her enemies, but also kill them every episode was a nice change for a magical girl. However, the silliness runs dry quite quick and the show becomes much more of a slog. Pair that up with less than pleasing visuals, almost no animation, and backgrounds that look like they were painted by children, the show has really shown just how much of a product of it's time it is. It's an interesting watch as a historic piece, but as an entertainment piece it is honestly not good. When Godzilla's in his heaven, all's right with the world. Director Hideaki Anno, creator of Neon Genesis Evangelion, turned the latest Godzilla movie into the highest grossing Japanese live-action film of all time. We went to the NY premiere, and it lives up to the hype!